Grenada has been our goal for many months now. We launched Rhapsody in November with the general plan of heading to Grenada for the hurricane season. We have been reading about Grenada as a place that many people leave their boats during hurricane season, sometimes staying with their boats and sometimes flying to other places to return during the next cruising season. A large part of the reason that people do this is insurance. Many insurance companies have rules about where you have to be during hurricane season. In the Caribbean there is a "hurricane box", the area in which you are not covered by insurance. What is "the box"? 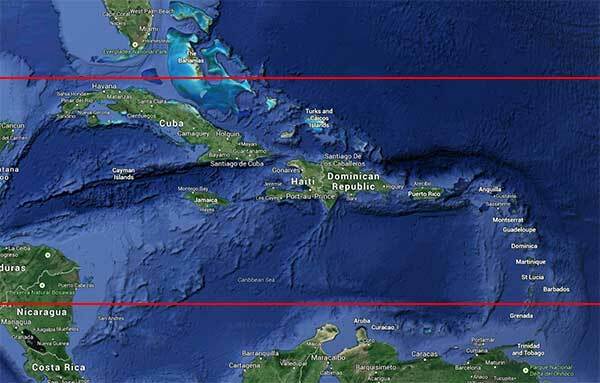 Most insurance companies won’t insure you if your boat will be within the Caribbean geographical box of 23.5 degrees North (Tropic of Cancer, Florida Keys) down to 12.4 degrees North latitude (Grenadines) and from 55 to 87 degrees West in effect between June 1 and November 1. Each insurance company can define their own box, but by General consensus, Grenada is out of the box. This does not mean that Granada never gets hurricanes, it just means that the likelihood is much lower, and being in Grenada will make your insurers happier. As it happens, our insurance does not have a "box", so we are free to sail up and down the Caribbean chain as we choose during the season. So why Grenada? 1) Very high on the list is the decreased chances of hurricanes here. We are not fans of having Rhapsody in a hurricane, so that was a big consideration for us. 2)The support for cruisers is strong here. Good grocery stores, Marine services, chandleries, Grenada is stronger in these areas than many of the countries that we have been passing through lately. 3) There is a strong cruising community in Grenada. This is a bonus for us. People to learn from, people to share stories with, and many cruiser organized activities. Grenada has earned the nickname of "Camp Grenada" because of all the activities available, hiking, running, music, dominoes, trivia, poker, to name just a few. Arriving in Grenada in June and waiting out the hurricane season here is a long time to be in one spot. We do have guests arriving this summer and I am looking forward to having them here, but I don't expect that we will remain here for the entire season (which lasts until November). That is a long time to not be moving. While sailing toward Grenada we have heard so many stories about it, it becomes hard for us to form a picture in our minds. What will it be like? What will the terrain be? The weather? The water? The anchorages? Where will we settle? How will we connect with the people? Are we expecting too much of Grenada? I don't think that we will find Grenada poor (as in the poem), and she has certainly given us a marvelous journey by being a goal to aim for. It is not the end of our journey, and now we will need to find our next goal.